Viðey, is the largest island in Kollafjörður. There are regular ferry connections between Skarfabakki, Reykjavík and Viðey. Viðey is only 3 km long and 800 m at its widest point, or about 1,5 km2. Viðeyjarstofa, Viðeyjarkirkja (church) and Viðeyjarskóli (school) have all been restored. Information signs are by the end of the pier, behind Viðeyjarstofa, by Viðeyjarskóli and by the foundations of the houses that once formed a village. 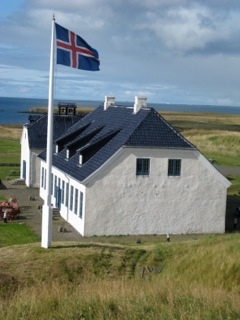 Viðeyjarskóli, the school, is on the eastern island. It ran from 1912 till 1941, with 40 students in its prime. Renovations were made between 1989-1993 and today there are good facilities for various occasion in the old school building. There is also a interesting exhibition on the islands history in the building. There are organized walkes around the island during the summer time. There are marked walking paths, a playground for children and a barbeque available for visitors. At Viðeyjarstofa is a restaurant. At Vesturey is a good walking route to the artwork of Richard Serra called Áfangi. On October 9th 2007 the light artwork of Yoko Ono, Imagine Peace Tower, was light for the first time. She dedicated the work to her husband‘ s memory, John Lennon. Every year the Peace Tower is light on John Lennons birthday and turned of on December 8th, the anniversary of his death.